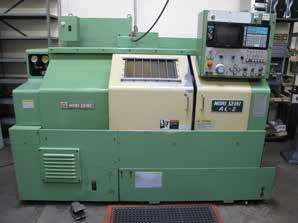 MORI SEIKI MODEL AL-2 CNC LATHE, WITH YASNAC CONTROL, 6’’ CHUCK,TAILSTOCK, 12 POSITION TURRET, S/N 1561. MORI SEIKI MODEL SL-1A CNC LATHE WITH YASNAC CONTROL, 6’’ CHUCK,TAILSTOCK, 12 POSITION TURRET. MORI SEIKI MS-850, 17’’ X 32’’ ENGINE LATHE, WITH 5C COLLET CLOSER. 1995 FADAL MODEL VMC-3016 CNC VMC, CT-40 TAPER, 20 ATC, CNC88HS CONTROL,S/N 9502107. FADAL VH5C 4TH AXIS INDEX. LAGUN FTV-2 VERTICAL MILL, WITH P.F. TABLE, 9 X 48 TABLE. BRIDGEPORT VERTICAL MILL WITH P.F. TABLE, 1HP, J HEAD. CHAMPION 5HP VERTICAL AIR COMPRESSOR. TWISTER SPEED LATHE INSPECTION TOOLS, MICS, CALIPERS, BORING TOOLS, DELTRONIC GAGES, HEIGHT MASTER, MICRO VU 10’’ COMPARATOR. GAGE BLOCKS, PIN GAGES, AND ETC. KURT VISES, ANGLE BLOCKS, AND INDEXERS. LARGE SELECTION OF CUTTING TOOLS, END MILLS, CUTTERS, COLLETS, SPRING COLLETS, BORING BARS, TOOL HOLDERS, AND SUPPORT.